I started working on this project a few months in advance of construction. The clients wanted the work to occur during the summer months. The advance notice allowed for a decent amount of time to develop the design, identify contractors, source materials, and leave room for things to go wrong. It’s helpful to have a target date for renovation, but only if there is adequate time to plan and prepare, and if there is good two-way communication. It would be tight, given some of the underlying issues I discussed in "the Before" post – ventilation, lighting, heat - but a reasonable goal. And then there’s the issue that something (almost) always goes wrong. Nothing insurmountable, just a few things that required me, the client, or the contractor (KS Renovation), to do some quick pivots throughout the project. Some building plumbing issues and ventilation limitations. A production issue with a specified tile. A broken slab of quartzite originally intended for the countertops. A missing component from the new bath tub faucet. As mentioned in "the Before" post, the client was generally happy with the layout of fixtures, which meant their were no significant changes to plumbing. There were a few upgrades for comfort and also for functionality. We added extra hidden fans to help the internal bathroom ventilate - important for sticky, humid NYC summers. For chilly NYC winters we added radiant heat under the newly-tiled floors, plus a new hardwired towel rack/warmer. We also upgraded a few of the the plumbing fixtures including a soaking tub. We opened up the shower box by maximizing glass in place of tiled partitions. We connected the vanity and bath area with a continuous counter top and matching shelving. This created a unified space - leaving no awkward gaps - and maximized the storage available. We also added niches to the bath and shower area. One customized and fun detail - a small footrest for leg shaving. We further connected the space using reclaimed wood from thresher boards to create a lighting soffit and open shelving. This simultaneously made the space feel larger by diminishing wall transitions and cozier by bringing you into the area. The texture and variation of the reclaimed thresher boards from Pioneer Millworks added to the personality of the design. The open shelving also helped to connect the gaps and wall transitions. In addition to the recessed lights in the wood soffit, we added lighted mirrors for illumination. We used a textured porcelain tile on the floor and one wall for its foot-feel, durability, and visual interest. A simple white, matte, large-scale subway tile is the backdrop for the lightest of grey painted cabinet faces. The reclaimed thresher board wood is finished with an oil rub. 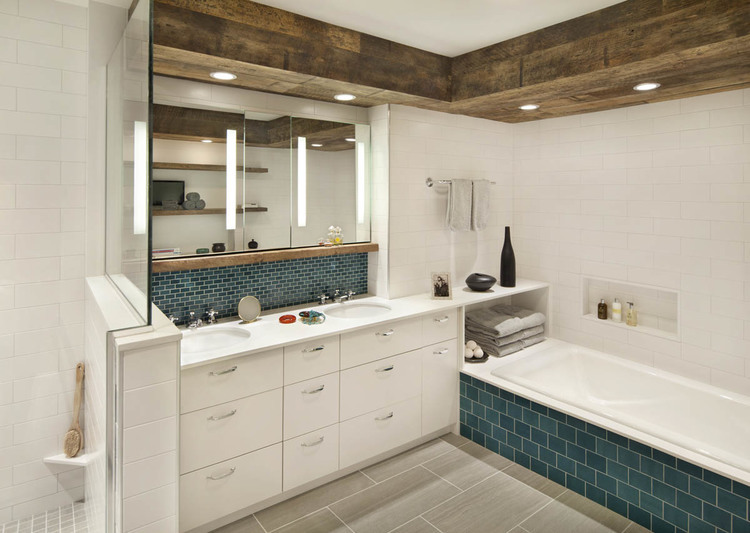 The smallest amount of chrome hardware and beautiful double-glazed teal tiles add a touch of sparkle and color. Elsewhere, in an attached dressing area, we echoed the color scheme with charcoal and blue wall paper. Here is "the After". Enjoy! View the Before post to see the full transformation.